At Vivid Audio, our team represents more than four decades of changing the way our customers experience sound. 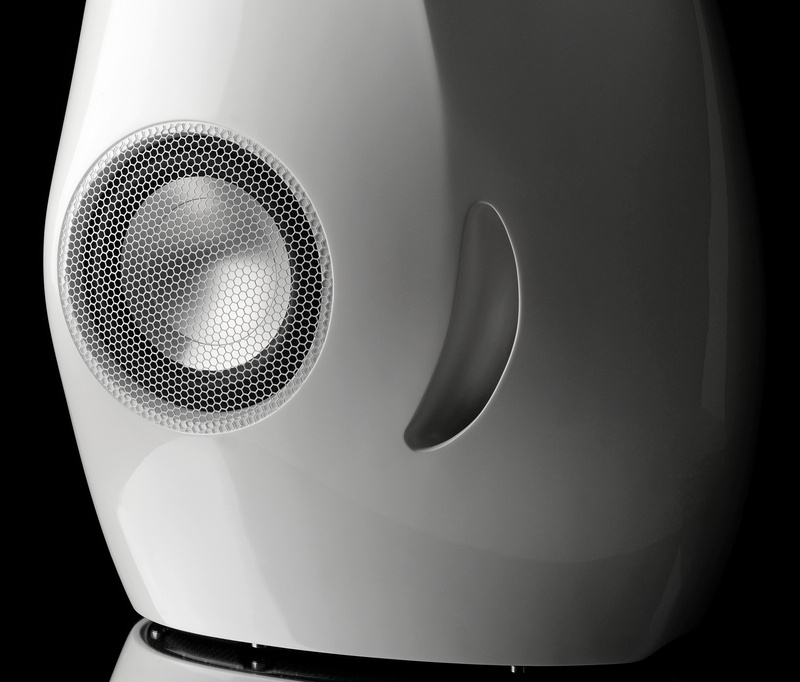 Our loudspeakers are designed to produce a perfectly transparent, symmetrical, open sound, free from colour, resonance and reflection, that connects you, the listener, seamlessly with the performer. We’re an engineering-led company, applying our unique acoustics expertise, technical skill and design creativity to develop truly ground-breaking products. Our customers include dedicated audiophiles, discerning music lovers, home entertainment aficionados and those who recognise, expect and demand the very best in everything. Welcome to Vivid Audio – and the world as you’ve never heard it before. 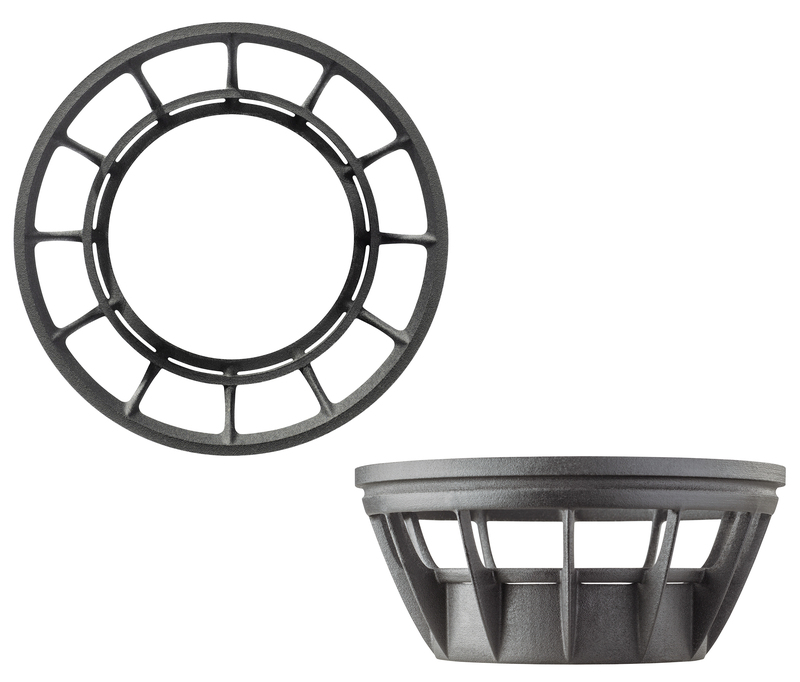 The diaphragm is a critical factor in loudspeaker performance. As it moves, it flexes, potentially creating the tinny, metallic resonance known as break-up. It’s possible to reduce this effect by damping, but it’s always a compromise. So, as engineers, we figured: instead of spending time and adding complexity trying to correct it, why not eliminate the problem altogether? 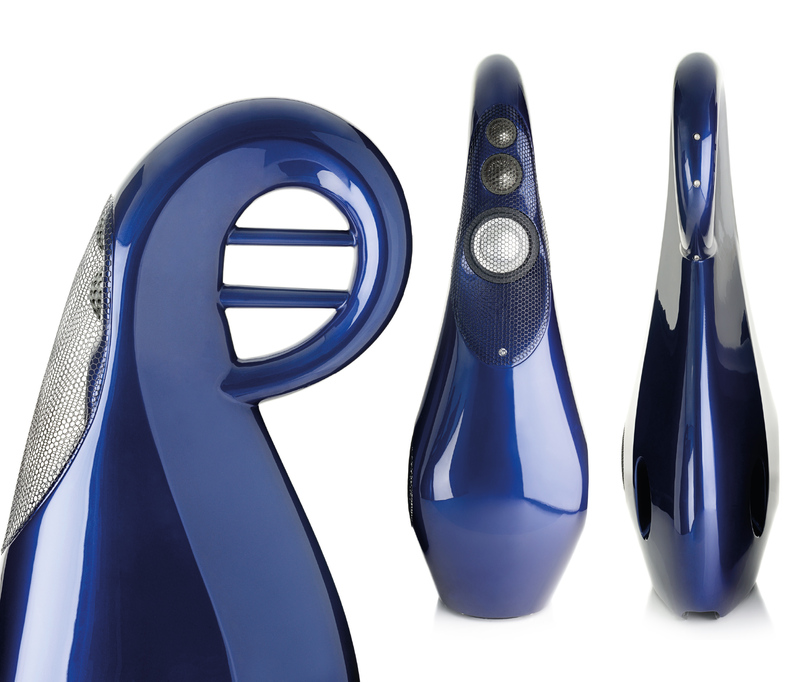 Our first advance was to apply a discovery made by designer Laurence Dickie more than 20 years ago. Adding a ring of high-modulus carbon fibre around the edge of the anodised aluminium alloy dome adds stiffness, and pushes break-up frequencies significantly higher. 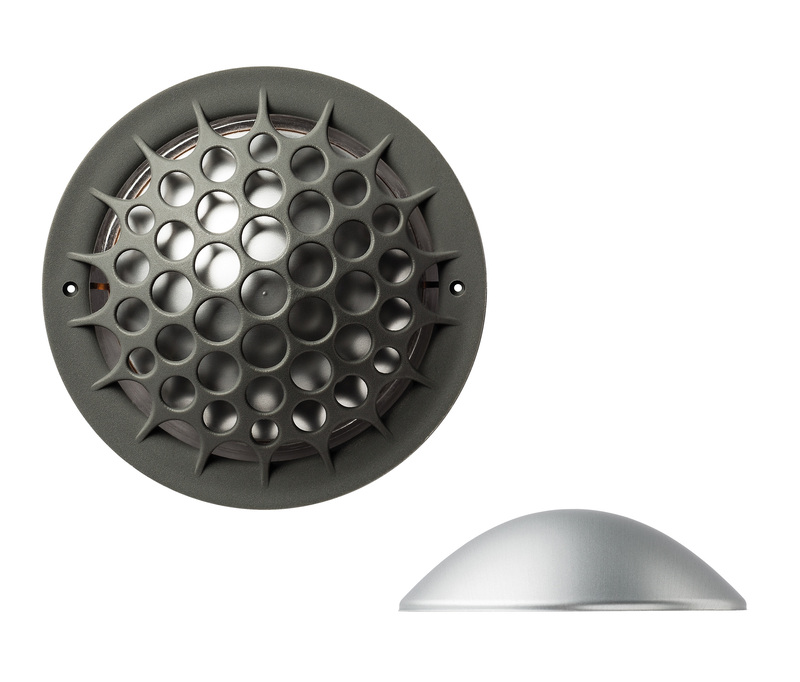 The real breakthrough came when we combined this technique with a reoptimized dome profile. Using finite element analysis (FEA) we discovered that a catenary curve – the shape naturally described by a length of chain suspended between two points – takes first break-up modes almost one octave higher than in a conventional spherical dome. This near-doubling in performance guarantees an unrivalled purity of sound, particularly in the crucial midrange band. We use this unique, patented dome profile in all Vivid Audio upper-mid and high frequency drivers. For the listener, the sound produced from the front of the loudspeaker is obviously what matters most. For us as engineers, the issue of the sound coming from the back is just as important. Unless it’s contained or dissipated, it will reflect off the back wall of the cabinet and interfere with the forward radiation, adding unwanted colour and resonance. 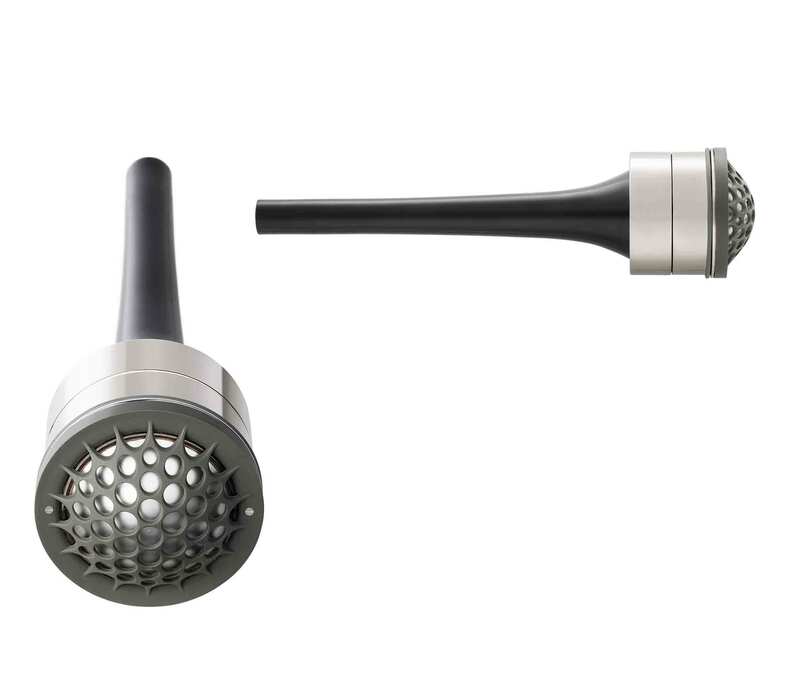 Our solution is Tapered Tube Loading (TTL) which is designed to absorb, rather than just contain, the rearward sound. The driver is coupled to a tube which narrows exponentially, and is filled with wool fibre. The taper naturally compresses the damping material, so that by the end of the tube, sound is absorbed entirely; none is reflected back though the diaphragm. TTL is now our standard solution for all Vivid Audio mid- and high-frequency units. One of the secrets behind our tapered tube loading technology’s outstanding performance is our innovative Super Flux Magnet. An essential requirement in the design of drivers for use with tapered tube absorbers is that they have a large central hole. 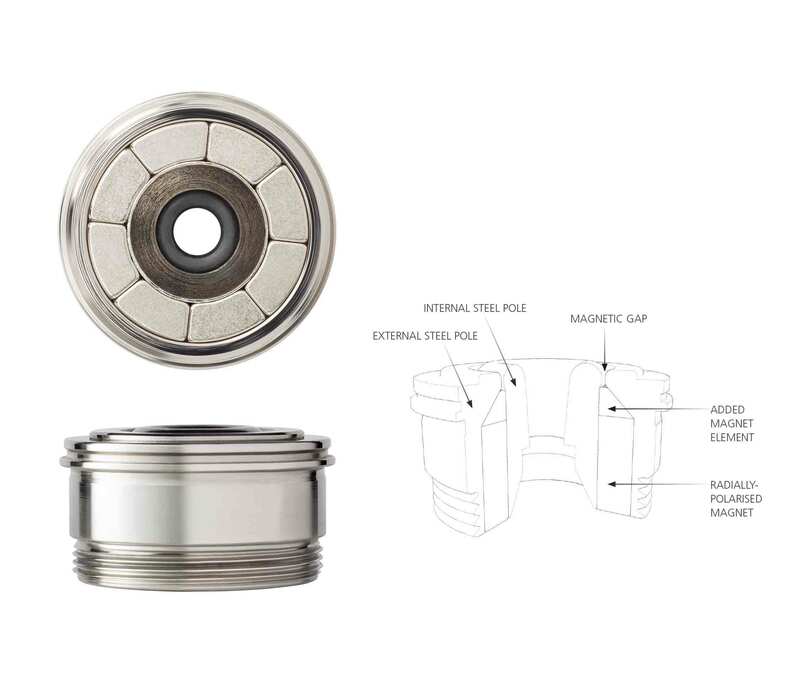 The rear-mounted radial magnet facilitates this while maintaining the smallest outside diameter so the drivers can be close together. 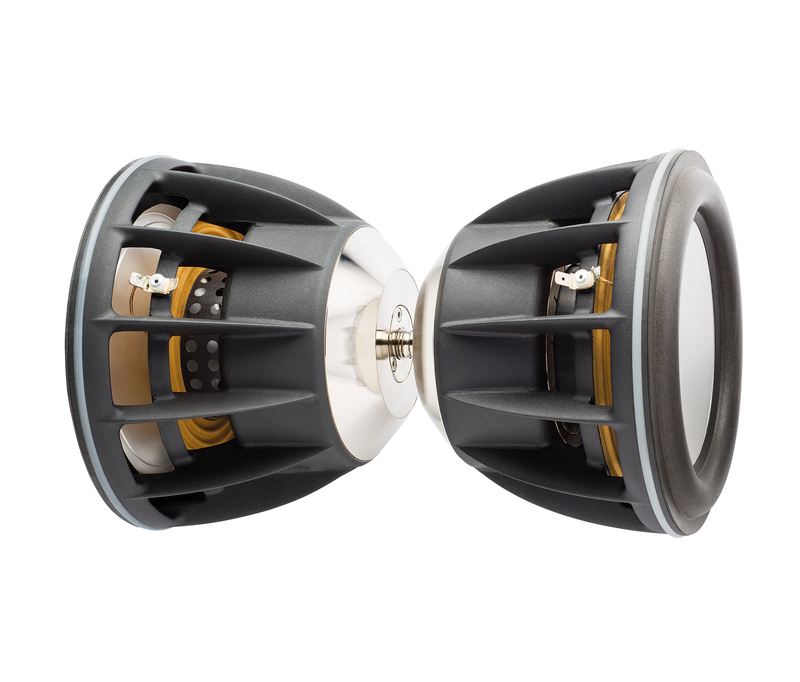 Our super-flux magnets feature a highly focussed field which give our D26 tweeter a peak flux of 2.5T – roughly twice that found on most 25mm tweeters – and an efficiency of 96dB/W. Another small but powerful example of our attention to detail - and refusal to compromise. To maximise magnetic flux, the gap between the coil and pole in a loudspeaker driver needs to be as narrow as possible (in ours, it’s barely a third of a millimetre across). As the coil former moves up and down in this gap like a piston in a cylinder, air is compressed behind the dust dome, creating drag and damping the motion of the cone, especially at low frequencies. The simplest solution is to make a hole in the magnet pole - but this produces resonance. A more refined approach is a row of holes in the coil former. This pushes up the resonance and reduces its sharpness (or Q-factor), but creates audible noise as the air passes through the holes. We’ve taken this a step further with our Highly Vented Former (HVF) in which almost half the surface area is made up of holes. This moves the resonance right out of band and lowers the Q-factor to the point where it’s almost undetectable; it also eliminates air noise, offering a near-perfect solution to an age-old problem. In loudspeaker drivers, the magnet, suspensions, voice coil and cone assembly are all held within the chassis. The key to a good chassis design is ensuring there’s nothing behind the cone which might cause resonance, reflection or any other disturbance of the sound coming from the rear of the diaphragm. Any obstacles will affect the cone’s free motion, and thus the sound coming from the front of the driver. In the early days, a chassis was little more than a pressed metal dish with holes punched in it: not surprisingly, this caused serious problems of both resonance and reflection. Today’s more refined chassis (including ours) are made from diecast aluminium; however, most manufacturers use broad struts, since this simplifies the tooling. In contrast, the 12 struts in a Vivid Audio chassis have a uniquely narrow aspect ratio, and are cleverly aligned to minimise obstruction. 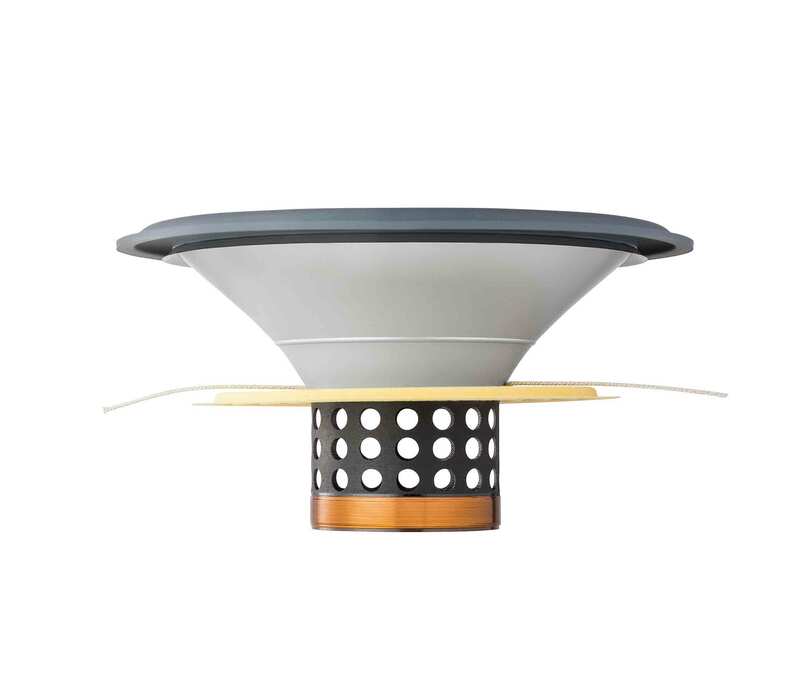 For example, our C125 low-mid driver has struts just 3mm wide; and with a total area of just 10% of the cone area, they’re acoustically all-but invisible. As well as their narrow frontal area, they’re also unusually deep. This has the added benefit of almost tripling the total chassis’ radiating area, making it a highly efficient finned heat sink for the motor assembly, reducing power compression as the drive level is increased. Newton’s Third Law of Motion famously states that ‘every action produces an equal and opposite reaction’ – a principle that applies to all mechanical systems, including loudspeaker motors. As the cone is pushed forwards by the current in the coil, it exerts an equal and opposite force on the magnet, causing it to move. In itself, this motion is harmless: the problems arise if the driver is coupled to the cabinet, which acts as a sounding-board and creates resonance and sound colouration. At Vivid Audio, we approach this issue in two ways. 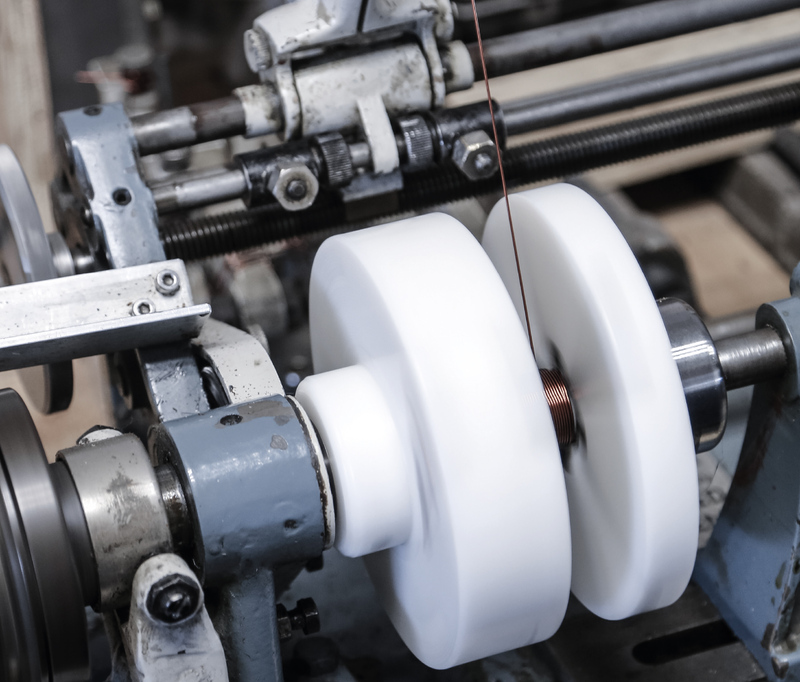 Our mid- and high-frequency units are suspended on silicone O-rings, which decouple the driver and the cabinet, preventing them exciting structural resonances. This technique doesn’t work with bass drivers, however. To decouple such heavy units effectively, the O-ring would have to be so soft that it wouldn’t support their weight. At Vivid Audio, we’ve developed a radically simple solution, called Reaction Cancelling Compliant Mount (RCCM). We place the drivers back-to-back on opposite side of the cabinet, with the magnets coupled together. The forces in the magnets are exactly cancelled out, so no motion is transmitted to the cabinet and all resonance is eliminated. Newton’s Third Law is also obeyed at the loudspeaker ports. Here, the air rushing in and out produces an equal and opposite reaction force on the cabinet making the quality of the port output dependent on the way in which the enclosure is mounted on the floor. We seek straightforward, elegant solutions wherever possible, and so developed our Reaction Cancelling Ports (RCP), which is simply two opposing ports that cancel the cabinet reaction completely. As engineers, we’ve always been fascinated by composite materials. And it’s their remarkable versatility and strength-to-weight that makes manufacturing our radically-shaped cabinets possible. We make them all entirely in-house, by hand, giving us complete control over materials, tooling, production, finishing and quality. One of the key features (indeed, selling points) of competing systems is their sheer weight. And in loudspeakers where you have front-mounted bass drivers, a heavy base is essential to prevent the cabinet from moving around. With our Reaction Cancelling Compliant Mount, we don’t require weight (even our flagship GIYA G1 Spirit weighs just 80kg) but we do need stiffness. So, we build our cabinets using a vacuum-infused glass-reinforced composite, which allows us to add rigidity exactly where it’s needed. Crossovers are essential to deliver the frequency band appropriately to the correct driver, keeping the drivers in phase and delivering a balanced sound. We use passive Linkwitz-Riley filters, developed in-house using computer-aided analysis and design, which give levels of smoothness, accuracy and phase matching once thought possible only with active systems. Unusually, and importantly, we build all our crossovers ourselves, in-house, which tests show yield better results than anything available from a third party. In combination with our smooth, edge-free cabinets, the crossovers deliver a near-perfectly balanced, symmetrical sound. The sound field is also very broad, so while there’s inevitably still a ‘sweet spot’ (as there always is with any stereo reproduction) where you sit in relation to the loudspeakers is far less critical than with many systems.